The Ellen G. White Estate — The official web site of the Ellen G. White Estate. Search EGW Writings - #1 — The official search engine for the EGW Writings. Search EGW Writings - #2 — An alternate search engine for the EGW Writings (under development)--works on Mac computers! 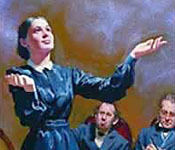 Ellen G. White Estate — Web & PDF study guides for 22 titles. Connecting With Jesus — Brief PDF study guides for 10 titles. Ellen-White.com — "Taking a closer look at allegations against the writings of Ellen White." A user-friendly gateway to resources. The Truth About Ellen G. White — A great introduction to the ministry of Ellen White. BibleInfo.com — Information on various Bible topics in multiple languages. HopeTalk — Online Bible studies in multiple languages. Adventist.Org — The official website of the Seventh-day Adventist world church. Church Locator (International) — Find the nearest Seventh-day Adventist church wherever you are in the world!